World's Finest #11 continues this titles' tradition of using different artists to depict different scenes. Sadly, none of this issue's artists are quite up to the standard set by George Perez and Kevin Maguire. This is not to say that the artwork of the issue is bad but it is flawed in some respects. 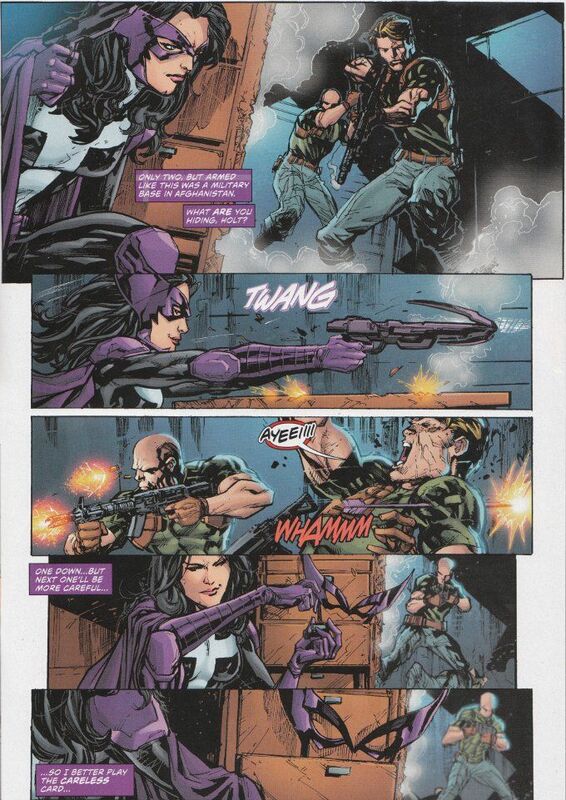 Ken Lashley pencils and inks the Huntress sequences with an amazing level of detail. Sadly, his inks obscure more than they enhance. The colorist also did the artwork a disservice, doing little to differentiate the tones of figures standing in the shadows from those standing in the light. 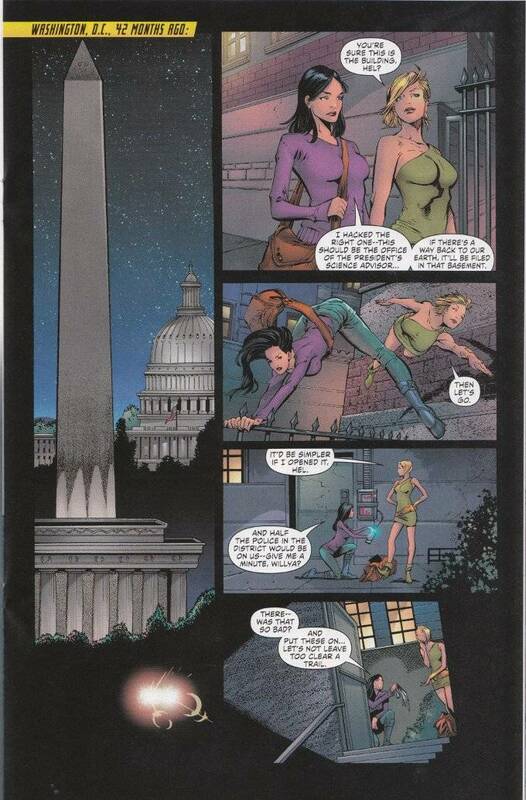 The Huntress/Power Girl team-up scenes fare little better. Oddly, they seem to suffer the opposite problem. Here, Wayne Faucher's inks seem to have skipped over the characters completely with all of the detailed highlighting and shading going into the backgrounds. This wouldn't be so bad if penciler Robson Rocha had bothered to give the characters much definition outside of the close-ups. I'm also not too fond of Rocha's character designs or poses. Take a look at Power Girl's neck in the above panel and Huntress's back! Barry Kitson's artwork, mainly centering upon the Power Girl solo sequences, manages to be "just right". The figures are clear. The shading is perfect. Yet Kitsn also delivers the issue's goofiest image on the final page. 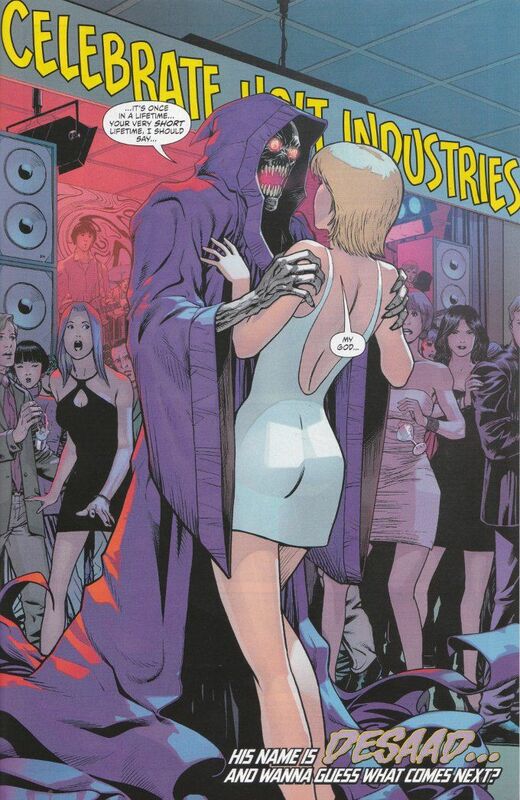 And I apologize for spoiling this shocking revelation, but since the fold-over cover also reveals the story's big surprise - that the New God Desaad has been masquerading as Power Girl's semi-boyfriend, I figure I'm okay. This new Desaad looks ridiculous! All of this is incidental to Paul Levitz script, which continues the circular trend of the past few issues. Michael Holt (a.k.a. Mister Terrific) continues his vendetta against Power Girl's secret identity. Power Girl and Huntress investigate his labs trying to figure out why. And up until the last page, they don't get any closer to figuring out what we've known for several months - it isn't Michael Holt! I'll give this book one more issue, primarily because I'm curious how the heck Desaad from The New Gods figures into all of this and if/when this book will tie in to the far superior Earth 2 title. As it is, that mystery and Kitson's artwork are the only things to recommend it. I hope it will get better next month.